Auto tekniikka ja kuljetus is Finland's largest and Scandinavian's leading professional motoring and logistic magazine! • Company directors and managers as well as contractors in the transportation business. 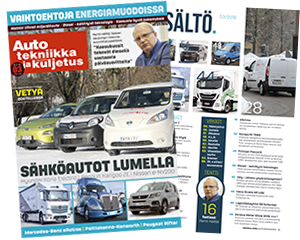 Ajolinja is Finland's only professional magazine for entrepreneurs and professionals in the field of transportation on the road! Ajolinja is a specialised magazine for professional motorist and associated machines and vehicles within the profession. Ajolinja is an entertaining news letter for traffic professionals and decision-makers. • Readers of Ajolinja influence experts in the area of transportation especially when it comes to decision-making of company purchases. The reader receives the needed professional and objective information from Ajolinja. The trustworthiness of the magazine is durable as the course of time has shown. Kone työ ja ympäristö is the decision-makers' and entreprenuers' in the mechanical field own professional magazine! The magazine reports the specialist's perspective on current topics in the mechanical field, especially on machines and equipment as well as questions on environmental information related to the profession. • The readers of this magazine are professional earthmoving, forestry, landscaping and maintainence contractors. • Service and spareparts decision-makers. • Community elected officials and authorities in the field. Kone työ ja ympäristö published as part of a Auto tekniikka ja kuljetus magazine. • SÄHKÖAUTOT LUMELLA. Pääsimme testaamaan talvisissa olosuhteissa vaihtoehtoisella voimanlähteellä toimivia pakettiautoja. • VETYÄ ODOTELLESSA. Raskaan kaluston voimanlähteenä ladattava sähkö sopii lähinnä paikallisjakeluun akkujen painosta johtuen. Kun sähkö tuotetaan polttokennolla, tilanne muuttuu täysin. Ajolinjan ja Auto, tekniikka ja kuljetuksen mediatiedot vuodelle 2019 on julkaistu. Copyright © 2011 B Yhtiöt Oy. Kaikki oikeudet pidätetään.